Water-repellent (WR) coating reflects only 0.24 percent of visible light, thereby minimizing flare and ghosting. 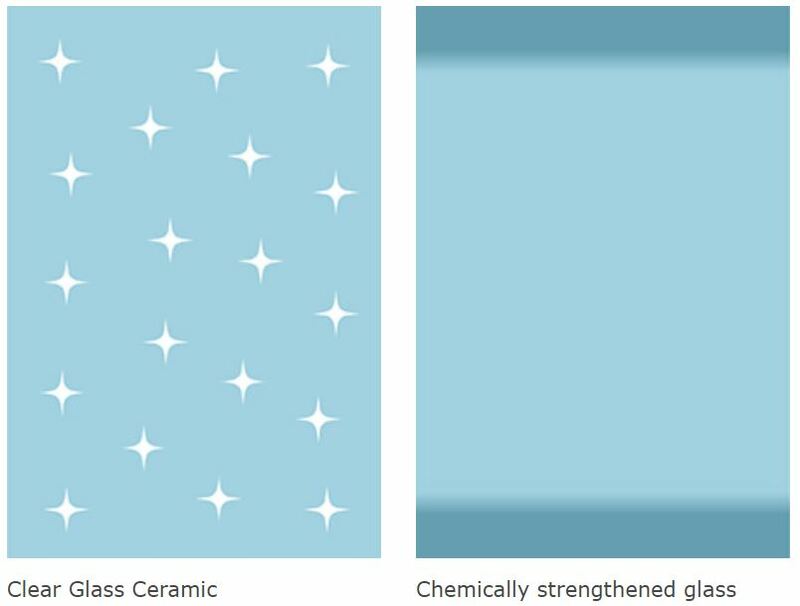 Clear Glass Ceramic is made with a special heat treatment that precipitates microcrystals of a mineral called spinel evenly throughout, giving the entire filter consistent strength. 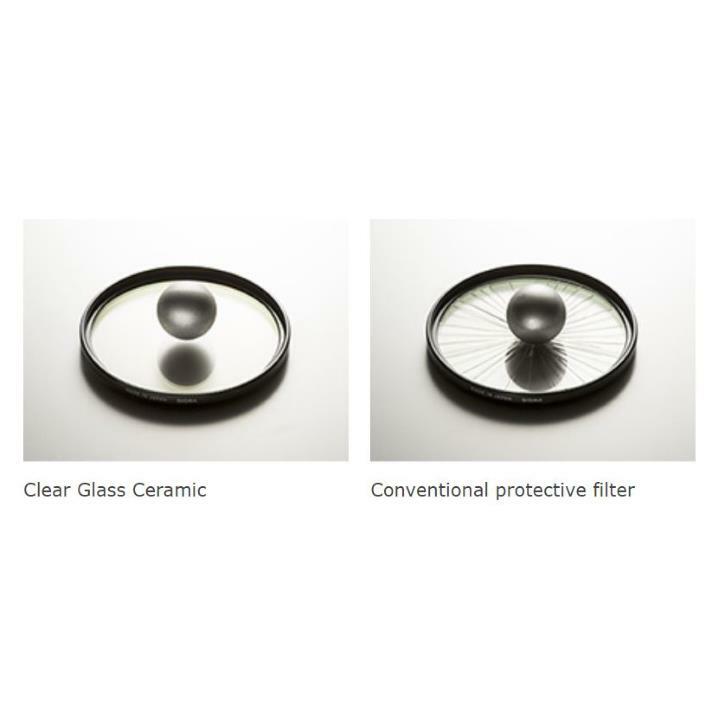 Clear Glass Ceramic offers a Vickers hardness number of 700HV, helps to prevent scratches and chips, which can lead to breakage of the filter. 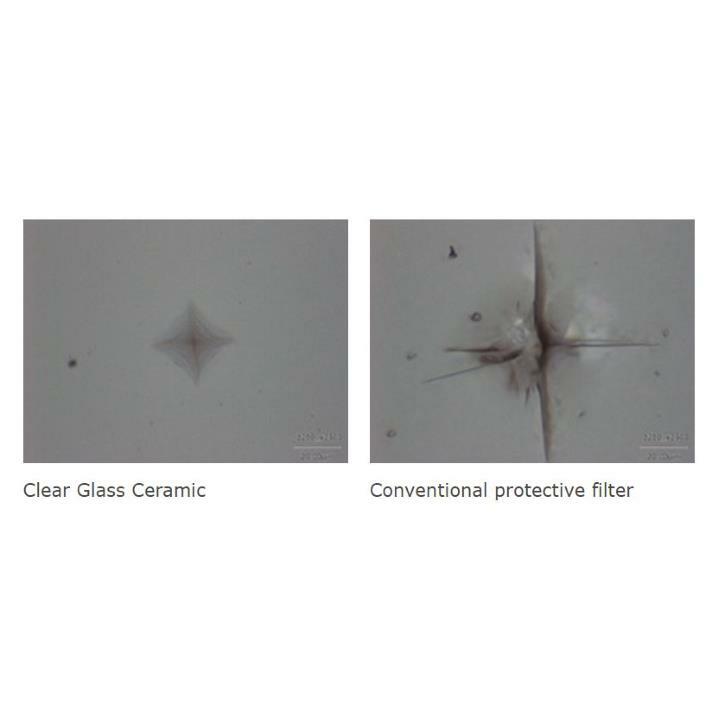 The new SIGMA filter made with Clear Glass Ceramic offers over 10 times the strength of a conventional protective filter and over 3 times the strength of a high-strength protective filter made with chemically hardened glass of the same thickness. Its ability to repel both water and oil is also excellent: water drops bounce right off, and fingerprints are easily removed with a quick wipe. 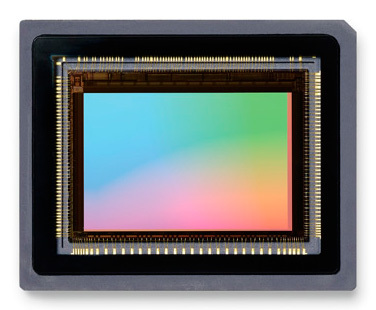 All SIGMA filters are manufactured to meet same standard as Sigma lenses, and checked with SIGMA's proprietary Modulation Transfer Function (MTF) measuring system (A1)* using 46-megapixel Foveon direct image sensors. 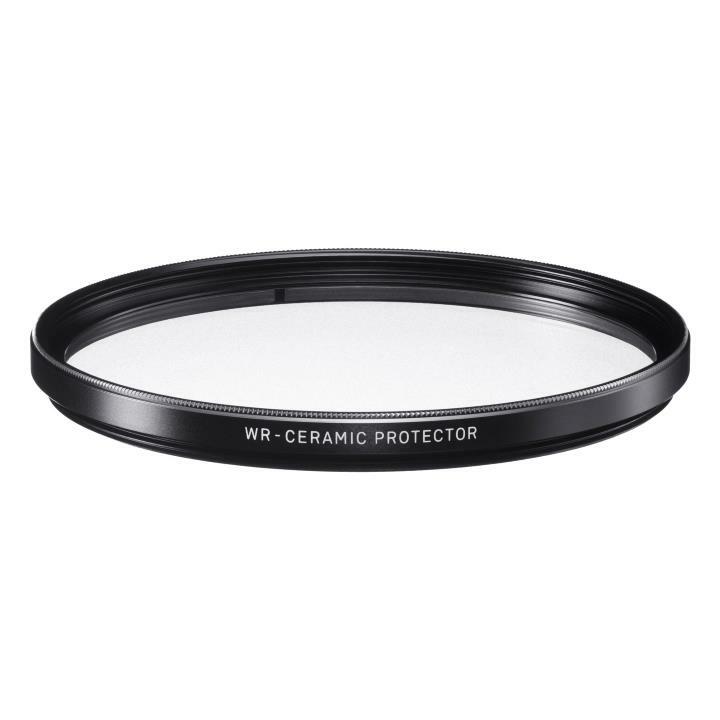 The SIGMA WR CERAMIC PROTECTOR is a highly reliable filter with outstanding protective capability featuring advanced material. Give your valued lenses the care they deserve with the true protector. Interchangeable lenses are the most important element of photographic expression, and to the photographer they are a valuable personal asset. To help photographers continue to use for many years the lens systems in which they have invested their time, knowledge, and budgets, SIGMA has developed original lens filters that meet the company's high standards of excellence. 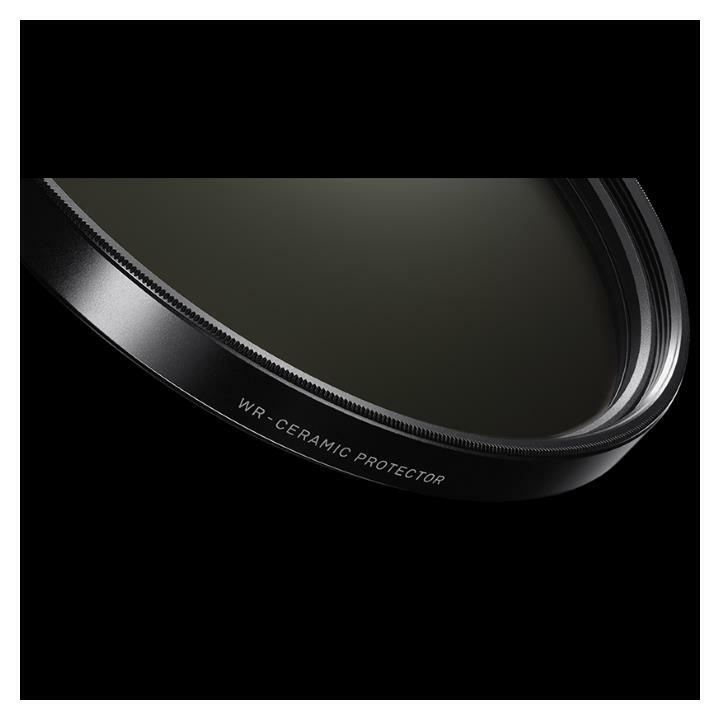 In developing its new protective lens filter, SIGMA has leveraged an unprecedented cooperative relationship with a glass manufacturer, resulting in a completely new type of glass called Clear Glass Ceramic. 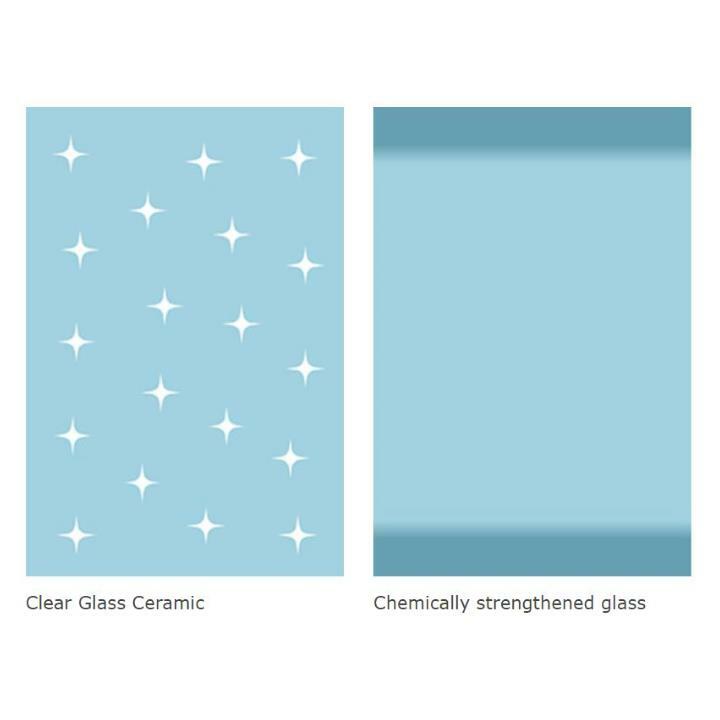 Clear Glass Ceramic offers a Vickers hardness number of 700HV. * This is a level of hardness much higher than that of chemically strengthened glass, which is used in conventional high-strength protective filters. Moreover, this higher level of hardness helps prevent scratches and chips, which can lead to breakage of the filter. *In the Vickers hardness test, a diamond instrument is pressed onto a material, and the indentation so produced is used to calculate the hardness of the material, which is expressed as a Vickers Pyramid Number (HV). The WR coating reflects only 0.24 percent of visible light, thereby minimizing flare and ghosting. Its ability to repel both water and oil is also excellent: water drops bounce right off, and fingerprints are easily removed with a quick wipe. This coating also offers high lubricating ability, giving it more than ten times the scratch-preventing capability of SIGMA's current Super Multi-Layer Coating. The coating's antistatic function helps prevent static electricity from attracting dust and other particles, which can easily be blown off the filter when they do adhere. Use of newly developed advanced material from glass manufacturer Ohara Inc. The SIGMA WR CERAMIC PROTECTOR features an advanced new material, the Clear Glass Ceramic, which is made using newly developed crystallized glass from glass manufacturer Ohara Inc.